Designed by Indesign Inc., the spatial and material attributes of Sportium stem from the sporting mindset, that of stadiums, sports fields, and athletes aiming for the podium. The building is conceived to stand alone, and to stand out and above the conventional retail architecture of commercial sites. The building is designed to be viewed from a multitude of approach angles with a recognizable imagery, essentially achieved by continuity of the external material treatment on all facades. Crowned with a projecting roof canopy, the forty foot high central atrium clearly signifies the building entrance and is prominent both from outside and within. Outside and inside demonstrate a straightforward and systematic material identity. The building methodology is that of prefabrication with the principal elements factory built and delivered to the site for assembly and installation. Full height concrete panels weighing thirty thousand pounds are mechanically connected to the steel structure. The exterior texture, the insulation core, wiring conduits, and openings for windows and doors are pre-calculated and incorporated into the panels during the moulding operation. The sandblast treatment creating the interior finish completes the fabrication process. The efficient nature of prefabrication greatly reduces construction costs and building erection time. Furthermore, as a result, the interior construction of gypsum walls is reduced to essential requirements. The notions of performance and efficiency, much sought after in the world of sports, are thus a true component of the Sportium architectural equation. The Sportium design is created as a progression of scale. First in importance is the white steel building structure comprised of large tube columns, beams and cross-braces. These elements define the primary spatial rhythm within the thirty foot high volume where the central atrium reaches upward to attain forty feet. Inscribed within this primary scale is the secondary modulation composed of a tubular system of goal post inspiration. The metal components of this system are fabricated and assembled using methods and technology kindred to that of the primary building structure, producing a conceptually coherent design both visually and physically. Positioned along the peripheral walls and stemming from the central columns, this secondary system provides support for sports equipment, sports clothes, and sports footwear to a height of 11 feet. The third level of modulation is constituted by the floor furniture system designed in an identical language of tubular sections and metal grills, with these being complemented by white lacquered showcases that feature and highlight eyewear and electronic merchandise. Most prominent in the Sportium concept are the ingredients of luminosity and fluidity. The central atrium and large corner windows allow daylight to inundate the interior while allowing the interior to resonate outside at night. Careful consideration was given to the balance of natural illumination and led lighting to ensure visual comfort and a positive spatial experience through the brightest and darkest months of the Canadian climate. The flooring materials of gray and white subtly alternate to contribute an effect of light and shadow all while referencing the linear markings of sports fields and courts. The green floor guidelines serve as a noticeable invitation to explore the vast selection of merchandise whether directly straight ahead, leftwards, rightwards and upwards to the mezzanine level. Within this environment the principle of way-steering is accomplished by the visual merchandise presentation displays. The intensive use of mannequins suspended on the upper steel grids designate locations of product types destinations of particular interest to the men, woman, and youth sporting shoppers. The disciplines of cycling in summer and cross country skiing in winter are found on the 50,000 square foot main floor. The 20,000 square foot upper mezzanine contains the disciplines of hockey, soccer, tennis, baseball, bodybuilding and yoga. 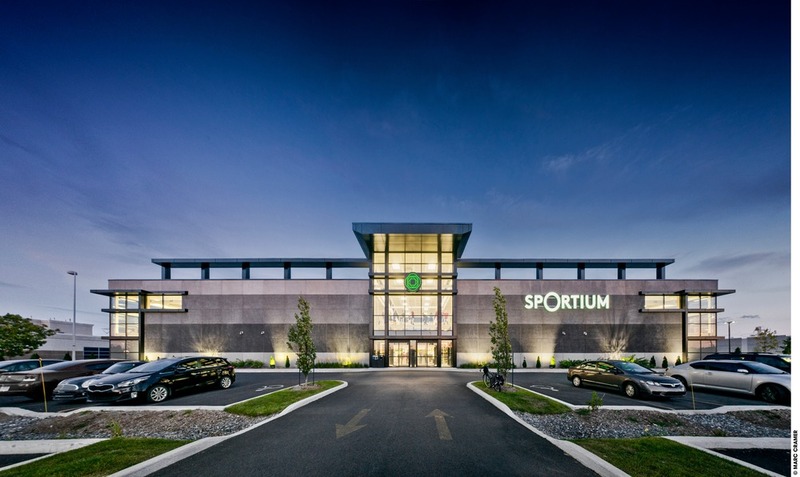 Together these floorplates combine to offer the largest of sport stores in Canada. Ever conscious of the highest level of service, the personnel of Sportium are chosen for their sporting knowledge and their present or past involvement in professional sports.